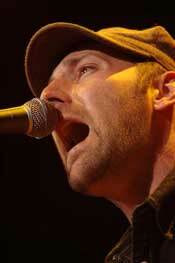 Mat Kearney offers a sound that is slightly tweaked from the usual poppy, fly-straight acoustic tunes that the John Mayer's of the world produce (pardon me if you are a fan of Mayer's). Mat makes music that appeals to the masses, without specifically trying to do so. He takes different musical genres and mixes them on his easel of thoughts and creations. With slower songs featuring piano and acoustic ones that sport hip-hop beats and rhymes, Mr. Kearney makes music that he has a serious passion for, and one that many individuals have gravitated towards long before the current big name tour. After being put on the bill for the current "Who You Oughta Know" Tour, Mat has been officially shoved into the spotlight by media giant VH1 whether or not his avid fans appreciate that he has gone 'corporate.' He deserves to be able to show the world these catchy, passionate songs in person, so that you can get a real feel for how well the hip-hop beats and lyrics mesh with the background of rock sounds, piano, and acoustic guitars. If you see it live it is an experience that will leave you enthralled with the overall product. Most people have a few specific music genres that they enjoy, and many of the times they will stick to what they are used to, but with Mat, he provides something that gives your ears a whole different style in and of itself, that gets you to sort of root for him to make it to the top. Once you hear his latest disc, "Nothing Left To Lose," you will want it playing in your car, in your headphones, in your portable stereo, and I bet you will find that it almost fits with any occasion. Mat played for the crowds of Chicago on two consecutive nights, and the HOB was packed with fans looking to get a glimpse of Mat before he grows to even greater heights. While giving 'The Feeling' a chance to showcase their talent here in a country where they have yet to fully take off, and letting Rocco Deluca provide us with proof that he is becoming big for good reason, Mat still steals the show. With two phenomenal opening acts, and then the 14-song set from Mat, Chicago was starry-eyed after seeing some major artists of tomorrow. On the 11 th song of the set, 'All I Need,' Mat showed the crowd that while he can sing and play guitar, he can also rock out on his piano. He started off this song sitting at the piano while his band mates took a back seat for the majority of the song. About 80% of the way through the song, the band came back into the picture to help him finish off the song. Other than the huge ovation after 'All I Need' and crowd favorite 'Undeniable,' the most amount of crowd noise came after Mat finished off the song 'Bullet.' People were singing every word of the chorus as loud as can be and we all felt the vibe that was present throughout the crowd. Mat is tearing across the country putting on one hell of a show after another, and is giving himself a reputation as one phenomenal performer. He is selling out shows nationwide, has the backing of a major media outlet in VH1, and is being preceded by a few bands that are bound to acquire the same levels of popularity Mat currently has. With a style that seems to be catching on more by the day, some will try to emulate it, but to no avail. This sound causes an itch that just can't be scratched. 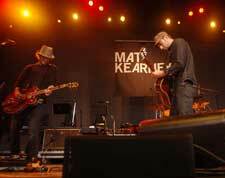 Mat's music is soulful, easy-going, happy, deep, stylish, and trend-setting. As he tears through his current tour and shows the masses just how much fun his shows and his music can be, he will continue to grab people's attention. He is an artist whose music paints a vivid picture, and Mat is one that will be painting those intricate thoughts for quite some time to come.